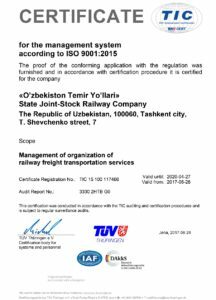 Uzbekistan Railways Joint-Stock Company was founded on November 7, 1994 on the basis of the former Central Asian Railway located in the territory of the Republic of Uzbekistan. At present, the structure of the company is undergoing fundamental reform. Special attention is paid to the denationalization and privatization of individual areas. maintenance, renewal of locomotive and car fleet. implementation of projects for the overhaul of the track, organization of production in plants of the company of track structure elements, spare parts, etc. Today, Uzbekistan Railways has several dozen projects that require investment support in implementation of which investors will have significant benefits. Uzbekistan Railways JSC since 1993 is a member of the Organization for Cooperation between Railways (OSJD). The company has close ties with the International Union of Railways (UIC) and the United Nations Economic and Social Commission for Asia and the Pacific (ESCAP). Uzbekistan Railways JSC is working together with the TRACECA project (Europe-Caucasus-Asia transport corridor) of the TACIS program of the European Union Commission. Taking into account that the Republic of Uzbekistan has a strategic geographical position in Central Asia and is the center of the region’s geopolitical development, the main transit corridors connecting the North and South, East and West of the continent pass through the territory of the Republic of Uzbekistan. This is one of the determining factors in planning the development of the joint-stock company and identifying issues that need additional study and optimization. Optimally formed and implemented transport policy, as well as the JSC development strategy, developed taking into account the needs of the state and consumers, in accordance with previously signed international agreements in the field of railway transport, focused on attracting investment in this industry and, accordingly, in the state economy, will play one of the most fundamental roles in ensuring sustainable socio-economic policy of the state in the future. increasing labor productivity, the level of mechanization and automation of the ongoing activities. The purpose of the Development Strategy is to form and continue the development of the railway industry as an integral part of the economy of the Republic of Uzbekistan, increase the country’s transport and transit potential, create new jobs, increase product localization level, maintain a coordinated policy in the field of transport and technical regulation, as well as ensure safety and increase the level of comfort and reliability of train movement, increase the investment attractiveness of railway transport. conducting further activities on harmonization of railway law, the policy in the field of technical regulation should be carried out jointly with relevant ministries and agencies, on the basis of state support. At the moment, the railway industry should complete implementation of previously planned projects, provide for perspective, high-quality development to reach a higher level of operation. 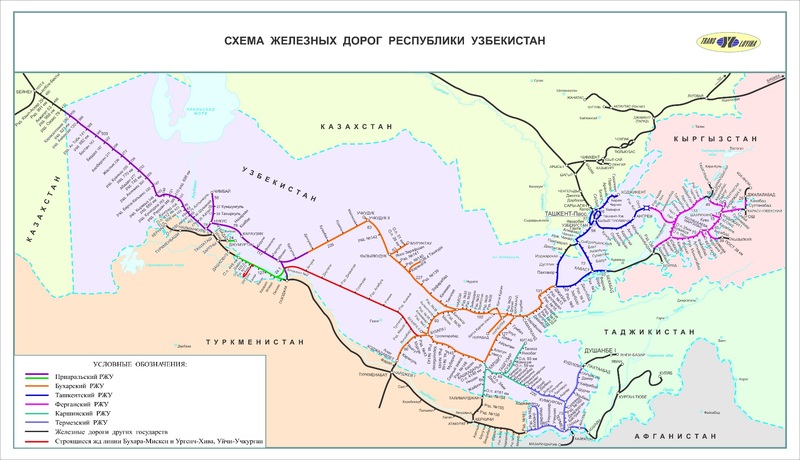 The experience gained in the field of construction and operation of the railway infrastructure with participation of the company’s own funds and widespread investment of both foreign and Republic of Uzbekistan provided an opportunity to reach the world level in construction and operation of the Hairaton – Mazar-i-Sharif railway line in the Islamic Republic of Afghanistan. Implementation of this policy and possible increase in the percentage of participation of foreign investors should be accompanied by a well-defined policy in determining the timing and amount of repayment of loans and conditions for their issuance to the public. modernized operating lines for the development of the estimated traffic volumes and organization of high-speed passenger traffic. development and implementation of innovative technologies. increasing the speed of passenger trains in the main directions. Implementation of the above works will provide a solution to state problems in the field of railway transport. As a result of implementation, a unified transport network of railways of the Republic of Uzbekistan will be achieved, the infrastructure of all regions of the country will be evenly developed, the rolling stock base will be updated, conditions will be created for stable growth of the state economy. Reforming the industry will ensure the optimization of its structure and the inflow of investments for modernization and expansion of the railway network. Modern technologies and manufacturability of production will ensure the need of the economy of the country for qualitative transportation. Improving the speed and reliability of cargo delivery will help to reduce the needs of commodity producers in working capital and, consequently, reduce the cost of production and marketing of goods and increase the competitiveness of the economy. As a result of implementation of the above works, the mobility of the population will be increased. It is planned to increase the polygon of high-speed passenger traffic (at a speed of up to 160 km/h and above). It is planned to develop human resources, increase productivity and improve the working conditions of railway transport workers, as well as increase safety, efficiency, environmental friendliness and economy of railway transport. Thus, as a result of implementation of the work, transport conditions will be created for ensuring the dynamic development of the country’s economy, the growth of the gross domestic product and industrial production. The quality policy of Uzbekistan Railways is aimed at increasing the number of consumers of railway services by constantly improving the quality of provided services, meeting the needs and expectations of customers, creating and strengthening sustainable competitive positions. The main activity of the company is aimed at providing high-quality services on organization and management of rail transportation that meets the requirements of safety, reliability, competitiveness, fully satisfies the wishes of consumers and meets world standards, taking into account the normative documents governing the activities of the company. providing access to open information to potential partners and customers of the public through the mass media. In accordance with the Resolution of the Cabinet of Ministers of the Republic of Uzbekistan No. 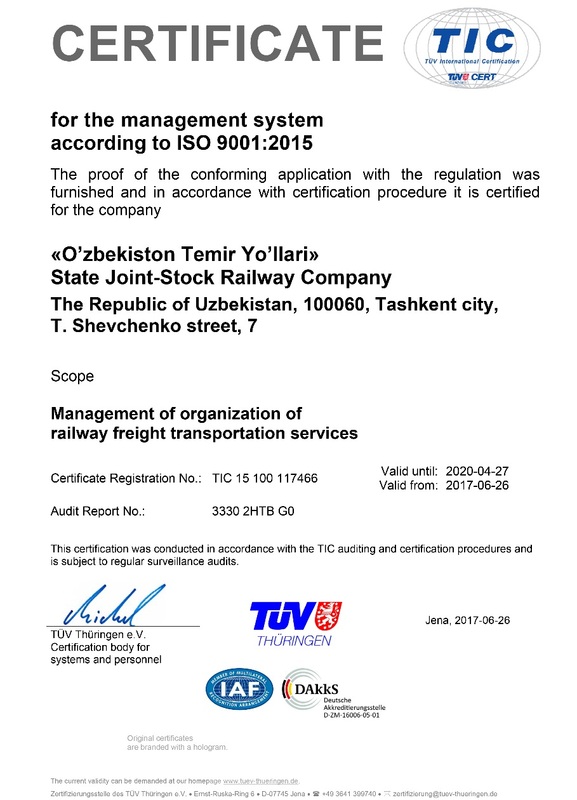 173 of June 19, 2009 “On additional measures of expanding the implementation of quality management systems compliant to international standards at enterprises of the republic”, the JSC Uzbekistan Railways introduced a quality management system in accordance with the international standard ISO 9001:2008. 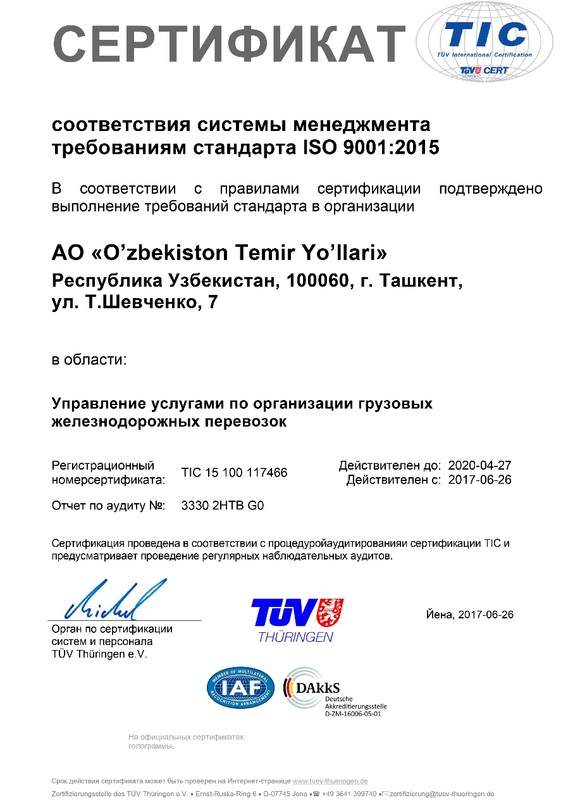 In connection with the decision of the international organization for standardization in 15.09.2015, a new version of the international standard ISO 9001:2008 has been published. 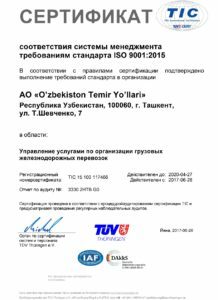 On April 27, 2017, JSC Uzbekistan Railways implemented a quality management system in accordance with the new version of the international standard ISO 9001:2015. 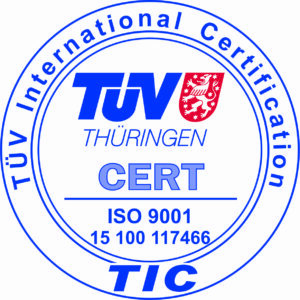 There is an international certificate. Regional integration, consistent and coordinated regional policy open up opportunities for Uzbekistan to strengthen relations in the field of transit traffic and ensure the expansion of trade within the region, harmonization of common normative policies, cooperation of border authorities and coordination of customs procedures. The impetus for expansion of trade activity is gradual development of a holistic, high-quality regional infrastructure. At present, Uzbekistan, for example, is betting on a more technological level of production and a departure from the resource dependence of foreign trade. Thus, the task has been set to establish the supply for export of already processed cotton yarn and finished textile products. This more development-oriented method of implementing domestic resources will bring more profit to the country than commodity trading. Uzbekistan is taking effective measures for ensuring the economic development and growth, despite the existing restrictions on foreign trade. For more than ten years, the growth rate of the economy has been steadily at eight percent. All available opportunities are being used to increase exports. Great importance is attached to regional cooperation, the development of mutual trade. The creation of free-economic zones in the regions of the republic became a practical step towards the formation of an effective infrastructure. Thus, in the FEZ “Navoi” an international intermodal logistics center, formed on the basis of the airport “Navoi”, is one of the largest and most high-tech air cargo complexes in the region. Today, it connects Uzbekistan with the main logistics centers of Eurasia – Frankfurt, Milan, Brussels, Vienna, Oslo, Basel, Zaragoza, Dubai, Delhi, Tehran, Inchon, Tianjin, Hanoi and Shanghai. Last June, the largest Uzbekistan – China cooperation project was implemented – the launch of Angren – Pap electrified railway line and Kamchik tunnel. As noted at the opening ceremony, this is a great achievement of Uzbekistan – China cooperation in creating an economic project of the Silk Road, a new impetus for the development of friendship and cooperation between our people. Construction of the road, in fact, completed the formation of a single integrated system of railway communication in Uzbekistan. The Angren – Pap line will ensure the transportation of more than ten million tons of cargo with a reduction in the time and cost of transportation several times, which will contribute to sustainable development of the economy of Uzbekistan. The commissioning of this railway line dramatically increases the transit value of Uzbekistan, and in the future it can become a key element of the most important international transport corridors, part of one of the projects of the “Economic Belt of the Silk Road”. “Development of road and transport communication is one of the important areas of the economic project of the Silk Road, is a priority of our bilateral cooperation”, — said President Xi Jinping at the time. — We attach great importance to Uzbekistan as a regional transportation hub and are interested in increasing cooperation with Uzbekistan partners in this field, continuous strengthening of infrastructure links in the region in order to create the best conditions for the development of both countries”. During a state visit to Turkmenistan on March 6-7, 2017, the President of Uzbekistan Shavkat Mirziyoyev and the President of Turkmenistan Gurbanguly Berdimuhamedov signed a Joint statement in which the heads of states highly appreciated the opening of Turkmenabad – Farab road and railway bridges. Their use will increase the transit potential of the two countries and create favorable conditions for a multiple increase in the volume of goods carried in transit through Turkmenistan and then on the Transcaucasian transport corridor to the countries of Southern and Central Europe, the Middle East, South and South-East Asia. The importance of practical implementation of the agreements on development of the international transport corridor Uzbekistan – Turkmenistan – Iran – Oman, which equally meets the economic interests of all the member states, was particularly noted. The parties emphasized the significance of the first meeting of the Working Committee on implementation of the Agreement on creation of this transport and transit corridor held on March 1-2, 2017 in Tashkent. Favorable conditions and provided mutual preferences for the transit of foreign trade goods through the territories of the two countries in 2017 will ensure efficient utilization of transport communications and infrastructure, as well as provide an opportunity to form clear and precise prospects for enterprises to ensure further expansion of transportation and attract additional cargo volumes. In order to increase the competitiveness and attractiveness of international transport routes running through the territories of the two countries, the parties agreed to continue systemic mutually beneficial cooperation aimed at further optimization of tariffs and the provision of preferential conditions for transit shipments of foreign trade goods. On March 22–23, President Shavkat Mirziyoyev paid a state visit to Kazakhstan, where he also signed a Joint Declaration on further deepening the strategic partnership and strengthening good neighborliness between the Republic of Uzbekistan and the Republic of Kazakhstan. It emphasizes the priority nature of bilateral cooperation in the sphere of transport and development of transit corridors, providing the shortest and most efficient access to the external market. The parties noted that establishment by the railway administrations of the two countries of mutual preferences and additional discounts on implementation of transit transport of foreign trade cargoes in their territories will allow to radically expand cooperation in this sphere and attract significant volumes of transit cargo. There is interest in the speedy implementation of the project of reconstruction of Beineu – Akjigit – Uzbekistan border, as well as other joint projects that provide alternative access to international maritime communications and promising markets for the countries of the region. At the meeting of heads of states, it was emphasized that the sphere of transport communications is one of the priority directions for development of partnership. Mutually integrated roads and railways of our countries. This important transport and communications network also performs a transit function for the third countries. The opening of the highway passing through the territory of Maktaaral district of Kazakhstan, connecting Tashkent and Samarkand, the launch of Tashkent – Almaty high-speed train and bus routes between the cities of the two countries will further strengthen transport links between our countries, will serve the development of interregional contacts, trade and tourism. Specific Action Strategy of Uzbekistan confirms the intention to consistently continue the creation and development of state and regional platforms for ensuring sustainable economic growth. Without access to the sea, the development of alternative ways of integration is for our country the most important task determining the future of Uzbekistan. It is known that Uzbekistan was famous since ancient times as a state located on the Great Silk Road, connecting West and East. Today, this ancient path continues to exist in a new form, linking peoples. At present, the modernization of the country’s economy and renewal, formation of qualitatively new structures, the integrated development of the regions are connected with the improvement of transport and communication system.